The Orthodox pray for the departed. The most pressing prayer within the liturgies appointed for this purpose is for God to forgive their sins. We say, “For no one lives and does not sin, for You only are without sin….” This is easily misunderstood, but it goes to the very heart of the mystery of our relationship with God. Again we pray for mercy, life, peace, health, salvation, and visitation for the servants of God [especially ______], and for the pardon and remission of their sins. All of this is complicated by our culture’s confusion about sin. When a contemporary person hears the term “sin,” they immediately think in legal terms. We think, “They must have done something wrong and now they need to be forgiven.” So, recently on Mothers’ Day, I intoned, “for our mothers living this day…and for the pardon and remission of their sins.” Some mothers might indeed look at us, their offspring, and think that perhaps they sinned by bringing us into the world! But this is not at all the meaning of the prayer. Sin is not a legal problem. It is not a breaking of the rules for which we now deserve punishment. When we ask for God to forgive someone’s sins, we are not asking God to “let them off the hook,” or some such thing. Sin and forgiveness have to do with our broken communion with God and others. It is a state of being out-of-communion or in which our communion with God and others is somehow impaired. God is Life. He is the Lord and Giver of Life. He is the only source of life for everything that exists. Our broken and impaired communion with Him results in death. St. Paul said, “The wages of sin is death.” It’s the natural outcome of broken communion. The only way to “forgive” such a broken communion is to restore it. That restoration of communion is the very essence of what we mean when we say “forgiveness.” To be forgiven is to be made whole, beginning with our communion with God. Thus, when we pray for the living, the very heart of our prayer is for the forgiveness of their sins. Not because we’re aware of some rules which they have broken, but because the forgiveness of sin, the restoration of communion with God, is the source of every good thing, without which nothing can be good or well. When we pray for those who have died and the forgiveness of their sins, we are asking the same thing, for their communion with God, whether broken or impaired, to be made whole. Of course, we enter mysterious ground in all of this. The Orthodox Church has very little to say in a definitive manner about prayers for the departed. The doctrine of purgatory is a development with Western Catholicism and plays no part in Orthodoxy. Officially, the Church says that our prayers for the departed are “of benefit.” They help. Some teachers in the Tradition hold that once we die, there is nothing that we can do for ourselves. But these same teachers hold that the prayers of the living do wonderful things for us. Others hold that we can indeed do things for ourselves after death, but also acknowledge the benefit of the prayers of the living. What is essential in this is something that runs very counter to our contemporary minds, formed as they are by the false assumptions of modernity. Salvation, the full and complete restoration of communion with God and our complete healing, is not a private matter. We are not saved alone, for “alone” is the very antithesis of salvation. Communion is how we exist. Neither can we have communion with God without communion with our neighbor (1 John 4:20-21), Our contemporary culture imagines that we are self-existing, that life is merely a matter of biology. However, true existence, both in this life and the next, is marked by communion, both with God and with others. This is the very heart of our salvation. That the Church prays for those who have died is the abiding confession that death does not destroy our communion with one another. That our prayers are of “benefit” for those who have died is the abiding confession that our communion is real and effective. That we ask the prayers of the saints is the abiding confession that those who have finished the course are of benefit to us. The teaching of the Church is that the prayers of the Divine Liturgy are the most effective prayers of all. For it is in the Holy Eucharist that the whole Church, on earth and in heaven, united supremely in Christ, its life in union with His sacrifice, is offered to the Father. Here the Son presents the Kingdom to the Father, that God might be “all in all” (1 Cor. 15:28). It is indeed tragic that contemporary Christianity has lost this ancient understanding of the faith. With the radical individualism of the modern world, the mystery of communion and true participation (koinonia) have been forgotten, and with them, whole passages of Scripture have ceased to have their true meaning. Even the word koinonia, which has the Greek meaning of “commonality” or “participation,” is rendered in English translations as “fellowship.” Instead, Scripture tells us that we are in Christ and that Christ is in us, that we are members of one single Body, that we have communion with the sufferings of Christ, that His death becomes our death and our death becomes His, etc. This most fundamental element of the grammar of Christianity has ceased to be spoken by most of the contemporary world. This same tragedy has deepened modern grieving and created the tragically feeble efforts now known as “celebrations of life” as substitutes for true Christian funerals. Memory, made as pleasant as possible, becomes the repository of those whom we now have truly “lost.” All communion is severed, and the dead pass out of our lives. But, in reality, they do not. The mind, bereft of true communion wanders about, seeking a solace that can only be imagined. Grief therapists seek to create psychological moments of healing with no basis outside of the mind and the emotions, places where dogs chase their tales in circles that can never be resolved. “Time heals all wounds,” becomes the modern panacea, so long as time promises a sad forgetfulness. As you see me set before you mute and without breath, weep for me, my brethren, family, and all who know me, for I spoke with you only yesterday, and suddenly the fearful hour of death came upon me. Come, all those who love me and give me the last kiss, for never again shall I journey or talk with you until the end of time. For I go to a Judge Who is impartial, where servant and master stand side by side. King and soldier, rich and poor, are held in equal esteem. For each will be glorified by his own deeds, or will be put to shame. But I ask and implore you all to pray without ceasing for me to Christ our God, that I may not be put into the place of torment because of my sins, but that He may appoint me to a place where there is the light of life. now and ever and unto ages of ages. Amen. The funeral marks only the beginning of a new communion. In Orthodox practice, prayers are offered on the third, ninth and fortieth days after death, and every year on the anniversary of our parting. Funeral services conclude with the ancient hymn, “Memory eternal!” In which the Church prays that God will forever remember the departed. To be remembered by God is nothing less than life eternal. The faithful are urged to give alms in the name of the departed. In traditional Orthodox practice, those alms were a way of asking for the poor to remember the soul of the one who had died. Candles are lit in memory and the prayers of the Eucharist are offered repeatedly. In Orthodox practice, the priest offers a service of prayers for each of the first forty days after death. Annual visits are made to the graves of the departed where prayers are offered yet again. "And For Thy Whole World"
Interesting post as always Father. I must say that the Orthodox understanding of death is a stumbling block to me. I come from a denomination that teaches conditional immortality (also annoyingly known as “soul sleep”). Ecclesiastes 9:5, 6 (“the dead know not anything”) and Psalm 115:17 (“the dead praise not the Lord”) were always taught as definitive proof texts against any consciousness in death. I haven’t been able to find an Orthodox treatment of these verses. Any insight you can provide on these and similar verses would be appreciated. The souls of the martyrs beneath the throne of God depicted in Revelation are clearly not asleep, but awake and praying. The witnesses that surround us described in Hebrews 12, are clearly awake and cheering us on. The verses you reference, describe not “soul sleep,” but the ineffectiveness of our lives apart from their proper embodied existence. We are not created to be disembodied souls. But there is clearly consciousness, awareness, even bliss, in the presence of God. The problems with some of the denominational theories about soul sleep is that they’re just making it up. They have no experience or revelation, just a theory by which they want to make their own private sense about life after death. Orthodoxy is not utterly definitive about many things in life after death. But there is, within the life and TRadition of the Church, the experience of true and living saints, those who have more reason and ability to speak about the things that are not of this world. The witness of the Church is of our living communion with the departed and their communion with us, and that they are aware. Soul sleep is just another theory of do-it-yourself groups. Having been taught it, I’m sure it works like an “ear-worm” of doubt. I’m just not sure how anyone could read Revelation and think that souls are asleep. Christ Is Risen! Thank you, Father. My Grandfather passed away last Monday (Memory Eternal!) and your post really strikes a chord. I found myself shaken and sad for even though as Orthodox we do not grieve as those who are without hope, death is frightful to me. Thank God for the Church who continues to pray for us even after our repose. Thank you Fr. Stephen. I might add that our very act of praying for the dead is of itself an affirmation and actualization of their holy communion with us, the Church. One of the beautiful parts of the Orthodox funeral service is that it allows for and supports our grief at loosing someone we love. At the same time it acts to move forward for the departed and those grieving. All done in the presence of God, the community and by His mercy. He had experienced the cathasis of the service and had a certain joy about him despite the loss of his co-worker. When I go to viewings for non-Orthodox friends I take the prayer book and stand unobtrusively and pray the Trisagion for the dead. When I am missing my late wife (11 years departed), I will take down the service book she used as a chanter, turn to the Trisagion and read through it, or rather pray through it. And tears come. Tears of loss, hope and sweetness at the same time. How true: “This is the very heart of our salvation. That the Church prays for those who have died is the abiding confession that death does not destroy our communion with one another.” Our relationships are eternal. The oldest grandparent that I can trace was born in 740 AD. He is still my grand parent although he departed this life nearly 1300 years ago. The same is true for every relationship we have. Thank you Father for this and all your other posts. The are good food for the soul. I don’t have a dropbox account to post the package, but can email them to anyone interested in looking at the materials. There is a resource I believe your readers would like to know about, my book is titled “When My Baba Died” and it can be found in the most recent Ancient Faith catalog. This children’s book shows the steps a family takes when attending an Orthodox funeral service-from Trisagion prayers in the funeral home to the church service to the cemetery committal prayers. It answers the most common questions children ask about death and also explains why we do what we do from an Orthodox persective. Most importantly, it emphasizes to the child the important role we play in continuing to pray for our deceased loved ones and reinforces the hope we have in a Risen Lord. I invite those interested to check out http://www.facebook.com/paschapress to read reviews and learn more about this valuable tool for the home, library, or classroom. I am very interested in your materials for prayer for the departed, and perhaps introduce it to our Mission Parish here. The most moving service I attended my first year after having been received into the Church was a funeral service. I had attended several of those “celebration of life” services before but it was the Orthodox service in which I recognized authentic family affection. The following Thomas Sunday the priest and the deacon went to the Orthodox section of the public cemetery and prayed Panikhidas at each grave. The Russian families brought small picnic lunches which they ate, sitting around the grave of their loved one. Some, mainly spouses, were wistful but nobody was sad. Thank-you once again for a very helpful post. I do have a question and a comment though, both of which are likely to further expose my ignorance of things Orthodox. Please understand that I am not opposed to asking God for mercy, but there are times when I think’ “God is mercy, it’s part of His divine nature. Why am I asking Him to be Who He is?” I mean I don’t want to take His mercy for granted, but neither do I want to “beg” Him as though I don’t believe Him to be Who He continually demonstrates He is. God’s mercy is not potential, it’s kinetic, He is constantly merciful. He is merciful to me now. The comment. You speak out from time to time about the “radical individualism” rampant in America especially. There is, however another somewhat more invisible but just as insidious force that is also at work. Many of the Eastern Religions seem to advocate and teach a radical depersonalization. In his song “Tears In Heaven”, Eric Clapton begins with the words, “Would you know my name, if I saw you in Heaven?” I understand the song is addressed at least in part to his dead son. But it’s an interesting question still. I wonder at times if the radical individualism you speak of isn’t a response to the loss of the true personhood God intended for us; in a sense what one Orthodox psychologist has called a “presentation self”. I’m not trying to justify it, it still demonstrates the lack of communion you speak of, but I think we often run the danger of mistaking individualism with uniqueness. As we try to cover our nakedness, as we long for life, as we have, in so many ways been both captive and oppressed isn’t it possible that substituting individualization for personhood is understandable (though still sinful)? Nothing we say changes God. Indeed, His mercy endures forever, etc. And, yes, we are asking God to be what He already is. The point of prayer isn’t something we do for God’s sake, but for ours. Asking for His mercy, is asking for His grace, kindness, etc. It is, essentially, disposing ourselves towards Him moment by moment. We open ourselves, etc. God is merciful to me now. Yes. But am I ignoring Him, destroying the communion that He gives every moment? In the history of Orthodoxy, there has never really been a tendency towards loss of identity. Personhood is too central. But personhood is not the same thing as individualism. It’s hard to understand, because we actually experience ourselves in pretty much an individualistic manner. It’s a result of the fall. Modernity, however, has raised it to a high cultural level and sought to reinforce it. Personhood contains a certain aspect of uniqueness, but we never truly exist as merely unique, as merely individual, as merely ourselves. The truth of who we are, our personhood, always exists in communion. For example, I cannot exist as a husband apart from my wife – the term would have no meaning. Likewise, in the revelation of God we hear: Father, Son, and Holy Spirit, no one of which stands without the others. God has revealed Himself, on His most absolute, fundamental level, in language that is a communion. In the light of our sin, almost everything we do to survive is understandable. Being pointed beyond it is simply sharing the gospel. Thanks for both of your responses. Yes, John Timothy, Orthodoxy is somewhat like learning a new language, or maybe like learning new meanings for an old one. Fr. Stephen, I guess that this is why St. Paul refers to us as a body. The parts are unique, but none function without the other parts in “communion”. One of the things addressed in the year of Jubilee, discussed previously was the return of boundaries lost. I take that to mean, possibly, in part, the restoration of personhood and, as you commented, in communion….struggle though it might be. I sort of understand the concept, but not the experience. I take you’ve thought about the Greek word for sin, ἁμαρτία? As you know, this has to do with “missing the mark.” Looking at Strong’s concordance here I also see it links semantically to a Greek adjective “meros,” which has to do with “part/belonging”, with the Greek privative-a , meaning “not belonging/not being part of.” With this etymology and linguistic grounding we could then link back to your comments here about the collective, and the ancient christian notion of salvation is being much more communal than what is perceived on in modernity. I wonder what Hebrew and Aramaic words stand behind this Greek, and how the Orthodox understanding you are pointing us to might be drawn out more with a look into that. I find your remarks on Orthodox funerals fascinating. It stirs a recollection of Orthodox Jewish funerals. They start with a remembrance of the departed and end with Psalms of the majesty of G-d. The effect can be felt almost as bleak. But the point is clear that affirmation of the greatness and goodness of G-d is the pinnacle of living. Many years, and memory eternal. My Wife and I are exploring the Orthodox faith, and this post raises several questions for us. We come from a Protestant background (Christian Missionary Alliance and Charismtatic/Pentocostal). Regarding the death of the saints (believers, Christians, etc) we were always told that “to be absent from the body is to be present with the Lord” (2Co 5:8). We were taught that this is meant to convey that our departed friends are “in heaven” with Jesus. If this is true how can our prayers help them be in a better communion with Christ? In Romans 8, Paul states that our sinful desires comes from being “in the flesh”. Do we continue to sin in “heaven?” Does our “fallen state” follow us there? If death liberates us from the flesh, how do we, in the presence of the Lord, continue to sin in death? You state that when you pray for the departed you ask: “for their communion with God, whether broken or impaired, to be made whole. ” If 2Co 5:8 is literal (or Luke 23:43 for that matter), how are Christians who are saved through the shed blood of Christ (insert your specific soteriology here) be in His presence but suffering from a broken or impaired communion? Thank you in advance for answering this! We love reading your blog as we learn more about the Orthodox faith. Frederika Matthews-Green put mercy (as prayed for in the Jesus Prayer) in this light, which I find very enlightening. [i]Why should we continually beg God for mercy?…Why do we have to grovel? The problem, I think, is we are imagining a prisoner in court, begging the judge for mercy. It is up to the judge whether to kill this man or free him, and she is justifiably angry. His only hope is to squirm and plead, and beg her to be lenient. Hmmmm, formatting issues. Will have to figure out what I did wrong there…. Memory eternal for your grandfather! And blessings to you and your family as well. This is all so new to me. Everything from sin as breaking communion with God rather than being more legal, to praying for the dead. It seems both very relational- which I’m just beginning to link to the heavily Trinitarian understanding of ultimate reality as relationship amongst a community. It also seems generous. Can I ask a question that means a lot to me- my parents both died as those who loved Jesus, & who had put their faith in his death & resurrection as putting right any breach between them & the Father. My Mum even forgave my Dad before she died for the many wrongs he did her, which I never thought I’d hear. Many friends have also died in the ‘orthodox’ belief, so to call it in a general sense, but not in the Orthodox Church, many would never have heard of it as I never had until recently. What does Orthodoxy say of their status beyond death? Every soul (not every Orthodox soul, but EVERY soul) is made living, is exalted and made shining, purified by the Three-fold Oneness in a hidden manner. Father, bless, and thank you very much! This is a wonderful article that I’m finding helpful in discussing Orthodox ideas with Protestant friends. It also deepens my own understanding, of course. Renewal, God is the lover of mankind and is generous. As the father of the Prodigal son saw him a great way off and ran to embrace him, so is our God. Fear not for your parents. Pray for them in Thanksgiving for He wills all should be saved. In Him we have redemption through His blood, the forgiveness of sins, according to the riches of His grace which He made to abound toward us in all wisdom and prudence, having made known to us the mystery of His will, according to His good pleasure which He purposed in Himself, that in the dispensation of the fullness of the times He might gather together in one all things in Christ, both which are in heaven and which are on earth– in Him. If someone quizzes me and says, “Will all be saved?” All I can say is that I have no way of knowing such a thing. It hasn’t been given to me. But to pray for all and to trust in the goodness of God, without exception, has been given to me (and to us all). So, I pray with great hope. And I know that I not only pray that way, but that “all of creation groans like a woman in childbirth” for the very same thing – according to Romans 8. It’s really great to be in agreement with rocks and trees, the rivers and the seas! May your parents’ memory be eternal! Thank you so much, Byron! And thank you for your clarification of what ‘mercy’ means in the Jesus Prayer. It had never occurred to me to think of it in this way…such inconceivable depths behind each word! @ Hugh, “Just because you don’t like it doesn’t mean it isn’t true” is the voice of a smug and embittered parent (or other would be authority). Do we think so little of Reality that we believe this or something like it to be the final word? Ultimate Things will be better than we suppose, not worse. One either has that hope or has nothing. Because and we do not judge those outside of the Church. But certainly judge those teachings which do not comport to the Gospel). Because prayer offered in love and faith. Resting in God’s mercy is no sin. Because We proclaim the Truth and call all Christians back to the Orthodox faith in unity bred by charity. Because all we will be judged, those who consider themselves teachers, more harshly. Do you want a conversation or do you want to pick a fight? You know full well what the Orthodox answer is. But your words mostly offer a hollow taunt – if you have nothing more to offer then please refrain from commenting. I apologize to the community for not policing things a bit more carefully. None of us needs to put up with someone taking “pot shots” and ridiculing the faith. Genuine conversation is welcome, from anyone. But conversation has some rules. On the blog, I make the rules. They can be read by checking out the sidebar. I’ve taken the liberty of removing some comments that I deem offensive. Thank you for your patience. One of the things that has attracted me to this blog is the interface with those of other faith traditions, who interact and sometimes become combative. In trying to stay out of the fray, I watch to see how you and others handle these discussions for in my ministry of Pro Life I am often surrounded and far outnumbered by Evangelicals and Reformed who want to challenge our faith. As I try to deal with and honestly answer them I often experience such interludes of hollow challenge. By watching you and others respond I am learning to handle similar challenges in a situation that I am not the Blog master. I actually am appreciative that you do not always stifle dissent at the outset so I can watch the conversation play out. Thank you for your patience with us all Father. I appreciate this as a safe place for Orthodox and Orthodox inquirers. Those interested in argumentation have a variety of places to engage in that activity and present their own views and opinions. there a very few safe places for us to be encouraged in our faith…but plenty for argumentation for dubious purposes. I thank you Father for your discernment in this matter. I really appreciate conversations with those who may disagree. After a while, instead of being a real conversation, however, it just becomes taking predictable shots. For example, for someone from a Reform position to ridicule the Orthodoxy because we think Sola Scriptura is nonsense and an impossible way to think, becomes beside the point. It would be more honest to say, “My view of Sola Scriptura can’t support your Orthodox understanding.” To which I can say, “You’re right.” I’ve written Hugh a lengthy note by email last week, detailing why we see Sola Scriptura is problematic. I’ve given time to this. But comments such as those today were not conversation – they seemed rude to me and ridiculing the Orthodox hope regarding the departed. So, he’s now on moderation. We never have to “win” an argument. Arguments do not bring people into the Kingdom or the fullness of Orthodoxy. St. Paisius said (I think), that someone could be converted by seeing a fox cross the road. I think we practice hospitality up to a point. But when the guest in my house starts throwing dishes around the house, he is politely invited to leave and get a room somewhere else. All of the arguments will go against us. All of the Protestant denominations are much better organized and more efficient and effective than the Orthodox. They have more resources. They’re reasoning will always sound plausible because it conforms to the spirit of the age (modernity). But it doesn’t matter. The truth is the truth. A tree doesn’t have to argue with anyone for being a tree. Orthodoxy is the Church. It abides according to the promise of Christ. Denominations spring up like weeds in the night, and they wither or evolve, or mutate. They have left Western civilization like a spiritual desert. The home of Reform (Scotland) is almost bereft of Christianity, a dry wasteland. Its fruit is dust, the fig tree withered. You are right and it was good that you stopped the conversation when you did and I learned from how you did it. My interest is more on how the conversation flows and how to deal with objections than the actually content sometimes. You are correct. In my studies I have seen the connection between the very worst of the schismatic theology of the likes of Anselm become the bread and butter of traditions such as the Reformed. As I learned in Apologetics to take the implications of a faith to their natural conclusion, the god of Anselm is a petty king who cannot forgive the insult to his honor that sin represents and the only way for him to vent his own angst is to kill his only son. This leads to a totally different end, which we can clearly see for Anselm’s version of god is a hypocrite that demands we forgive our enemies, love them, and pray for them while he remains aloof and angry, killing those who are guilty of sin. I know this is hyperbole, but it is the reality of his philosophy. Thank you again for all that you do. Thus, here, at his blog Father Stephen has the last word. And rightly. But my “shots” ~as they were called~ were merely meant to cause everyone of us to think about our prepsuppositions, to question what is the ultimate source of our various dogmas. Are we merely exalting sentiment and best wishes to the level of doctrine, and then reading these into the texts of Scripture? Father, the recent conversation in this thread reminded me of a passage I read recently in the book of collected interviews and homilies, etc., of the late Fr. George Calciu. He recounts an episode during his second imprisonment after he had become a Priest in Romania under Ceausescu’s sadistic Communist regime. It so happened that there was a young prison guard who was particularly cruel and could not seem to go a day without mercilessly beating the inmates. When the guards entered the prison at shift changes, inmates were required to face the wall of their cells and were not even allowed to look at the guards. However, this particular occasion was Pascha, and Fr. George was filled with joy after hearing the pealing of all the bells of all the surrounding churches at midnight, so when this young guard came on shift at 7:00 a.m., Fr. George did not turn to face the wall, but rather looked him in the eyes and joyously declared, “Christ is risen!” Quite unexpectedly, the young guard did not get angry, but rather replied, “Indeed, He is risen!” Fr. George’s explanation is that it was an angel speaking through the young man. Later that evening, another guard came on duty who Fr. George knew would have heard of events from earlier in the day. Again when the guard approached Fr. George’s cell, Fr. George proclaimed, “Christ is risen!” This time, the guard replied, “Did you see Him?” Whereupon Fr. George began giving all of his arguments for why faith in Christ’s resurrection is reasonable, and the guard had no answer for him. Because of the rationalism of the modern Christianity in which I was raised, this account in particular really struck me powerfully. To me, it really underscores St. Paul’s teaching in 1 Corinthians 2 as well. I am continually confronted with how so many modern approaches to evangelism and discipleship seem to rely on man’s persuasion (even sometimes cultish manipulation) and rational argument from the Scriptures over against the demonstration of the Holy Spirit’s power. But, we don’t argue or persuade of the gospel. We simply announce it and live it! In Orthodox conversation, there is an ethos, permeated by Scripture and the Tradition, the lives of the saints, and the teaching of the Fathers. We do not constantly quote Scripture trying to “prove” this or that. Such an approach is rooted in false assumptions. For example, you see a verse (as you have) and think it has a “legal” framework, a penitential substitution, etc., and you quote it, claiming that you’re not engaging in sentiment, wishful thinking, etc., but are instead basing your argument on Scripture. But you’re not. You have already assumed a framework that is contrary to Scripture and the Tradition of the Apostolic Fathers. It probably pleases you because it makes sense to you, and you like for things to be like that. But you do not examine yourself. The fact is, Sola Scriptura is a false doctrine, as practiced by Protestants, and has been the source of heresies, particularly among the followers of Calvin. You accuse others but you should accuse yourself. It is useless to argue that the Orthodox do not reason in the manner of Reformed folks. Of course we don’t. This source might help explain our point of view: http://www.traditioninaction.org/religious/n026rp_Lerins_PreserveFaith.htm. [i]Are we merely exalting sentiment and best wishes to the level of doctrine, and then reading these into the texts of Scripture? It seems we often come back to this issue concerning Sola Scriptura. I feel sorry for those who have not really got the security of the One Holy Church to rightly interpret things. And I cannot help wondering in awe at the great blessing our holy priests are to us! The Protestant style of quoting scripture to make a point is occasionally inspiring (it all depends on the point being made though) and can be comparable to what we also sometimes witness in Orthodoxy. However, there are times when it becomes evident that this ‘style’ “speaks Scripture” in a different way and through a different ‘tradition’. The Orthodox Tradition is completely unlike this as it is always firmly founded on the first-hand experience of those who beheld God. This is exceedingly more secure than any text in the hands of those who only have a rudimentary version of such an experience and yet assume they have no need to be assimilated to Tradition. The saints’ experience, which informs Holy Tradition, is also a remarkably consistent thing, it is ‘a single whole’ and speaks unanimously (as what we call Holy Tradition -whether it does this with or without the usage of Scripture). Therefore a downright unlettered person ironically can match or exceed the capability of an erudite individual in becoming a saint, in escaping heresy as well as in grasping the hidden depths of Scripture, despite not being able to read it. He knows what is far greater: Christ the Word of which the Scripture speaks. The beholder of God knows God, (and can therefore obviously understand Scripture properly too,) whereas the Protestant mind is not far from the secular mind which can only philosophise based on rational constructs or on second and third-hand experiences and with constant danger of going off the rails of truth. There is indeed sometimes a characteristic, ‘Western’ arrogance in this direct investigation outside of the stream of Holy Tradition, yet such Scriptural analyses are of a “Quran-style” and are also fertile ground for misunderstanding the experience of the Uncreated (as well as of created things). The Prophets, the Apostles and the Saints do not require Scripture despite their love of it (Scripture will not be needed in the Kingdom of Heaven); at the same time it is through their vision of God (after purification, illumination and deification) that they discern the Word of God hidden in the words of Scripture. That’s another reason why we often say that ‘the Church interprets’, – through Her representatives par excellence, the saints. There is one thing that puzzles me. I think I understand what you mean by communion of the saints beyond death and why we ask God for things he already wants to give. But to me “I ask and implore you all to pray without ceasing for me to Christ our God, that I may not be put into the place of torment because of my sins” jars with “But the souls of the righteous are in the hand of God, and no torment will ever touch them.” It does not seem to be praying for something that God is willing to give but something that God has already given. In other words, to pray for the faithful not to be put into the place of torment suggests to me doubt concerning something God has promised. It seems that you may be looking at these prayers in terms of legal imputation? If so, This is foreign to the mindset of righteousness as a gift of grace in synergy for Orthodox. But to me “I ask and implore you all to pray without ceasing for me to Christ our God, that I may not be put into the place of torment because of my sins” jars with “But the souls of the righteous are in the hand of God, and no torment will ever touch them.” It does not seem to be praying for something that God is willing to give but something that God has already given. In other words, to pray for the faithful not to be put into the place of torment suggests to me doubt concerning something God has promised. It sounds to me, and please forgive me if I am misunderstanding your question, that you may be putting too much emphasis on the “place” that is being mentioned. I think these statements reflect an attitude of theosis; if we embrace our sin, we “put” ourselves in a “place of torment” but if we join with the righteous, “no torment will ever touch” us. The two statements are not examples of a division. Instead they are representative of the crying out of our hearts as we seek God. Hopefully others here will correct me if I am incorrect. So when we beg (again, language) God to keep forgiving the sins of the departed, it is only understandable, i.m.o., that many – Orthodox included, not just our Protestant brothers and sisters – would conclude that we can and do continue to commit “acts of sin” after death which will “need” to be forgiven, and we’re very concerned that our loved ones who have gone before will find themselves committing such sins, and therefore will continue to need to be forgiven before that awesome and dread Judgment Day. In my (certainly still hoping to be more enlightened) opinion, it would be clearer if the language of the prayers for the departed said “and for their continued healing and growth in communion with God,” or something of that nature, instead of continuing, over and over and over for God “to forgive their sins.” The parable of the rich man and Lazarus seems to indicate that, after death, there is an impenetrable gulf between heaven and earth, and nothing we, the living on earth, can do to help the departed who have seemingly never repented while on the earth. Kallistos Ware, if memory serves, said that prayer for the departed is not necessarily because we believe we can somehow alter their eternal destiny, but mainly because we love them, and don’t want God or ourselves to ever forget them – may their memory be eternal. The parable of the rich man and Lazarus seems to indicate that, after death, there is an impenetrable gulf between heaven and earth, and nothing we, the living on earth, can do to help the departed who have seemingly never repented while on the earth. Please go back and re-read carefully the parable of Lazarus. It is constantly repeated that this indicated a firm gulf between the living and the dead. The parable says nothing of the sort. The gulf in the parable is fixed between two “dead” people…one in “Abrahams bosom” and the other in a place of torment. There is NO mention of a firm fixed gulf between the living and dead. This kind of repeated meme continues in the Protestant circles I run in…and it simply twists Scripture. V. 26 indicated the gulf is fixed between two groups in the afterlife. Perhaps analogous to the sheep and goats. Fr. Meletios Webber used to always emphasize that the Orthodox Church offers such wonderful assurance of having the fullness of Faith. *I* don’t need to know and understand *everything*, the Church (and Her Saints) does and I am part of It, and therefore I can be assured I am participating in this fullness…. 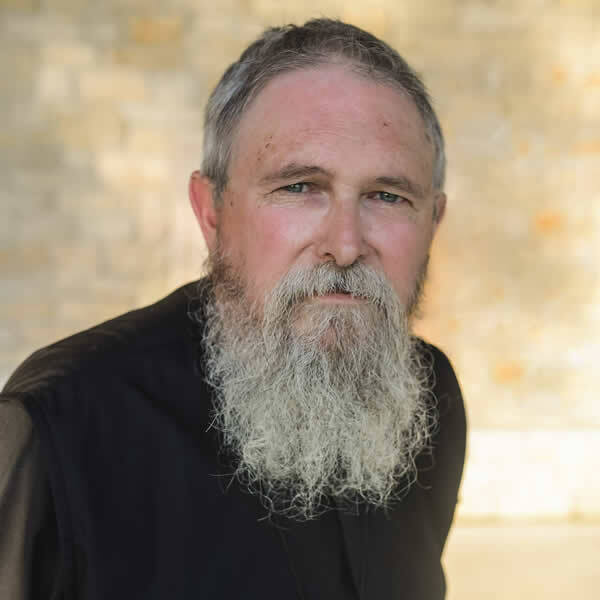 Dr. Clark Carlton has this wonderful podcast on how the development of dogma (definitions and spelled out interpretations) only developed as a result of heretical ways of thinking that developed when people departed from the participation in the One Holy Church and Her Tradition…. Onesismus, I do not look at either of these texts through the lens of legal imputation although I am not sure it would matter if one did. I see someone seriously considering the possibility of an experience of torment (however this is precisely understood) over against a text that seems to deny explicitly that there is torment for those on the Lazarus side of the great divide, so to speak, although my concern is less with “place”. Hence, Byron, your explanation gives me food for thought but it does not yet help me to resolve the dilemma. If the alternative is rephrased as one between “embracing our sin” and “joining with the righteous,” then the prayer seems to allow for the possibility that faithful believers who ask us to pray in this way might be embracing their sins beyond death and thus “put” themselves in a “place of torment”. But is “Lazarus” in such danger? Do the battles against sin continue beyond death so that some you lose and some you win? I have confidence that while here on earth I am still sometimes embracing sin rather than Christ, beyond death I will only be embracing Christ and never sin. Have I misread the promises? The only statement I can make concerning anything beyond death is that we pray in hope, not understanding/seeing the entire picture at this time. The prayer itself may be picturesque to remind us of our need for God’s mercy as well as to pray for His mercy on those who have gone before us. Just my thoughts. I think, could be wrong, that there is inherent in many attitudes to dying and what happens afterwards that God is our enemy or we are His somehow. That attitude is not valid. In the Orthodox Church God is frequently described as “the lover of mankind” even “the only lover of mankind”. That is not just a general love however, love means nothing if it is not specific, it is just a sentiment in a general sense. So any proclamation that “I am a Christian” must be backed up with what I do. Do I act in love, in mercy, in kindness, in self-restraint, in self-emptying. We are also constantly instructed and frequently experience the specificity of His love, for example, me in the Sacraments of the Church particularly the Eucharist where we each receive personally the Body and Blood of our Lord. It is impossible to take the prayers for the dead out of the context of the whole life of the Church, visible and invisible. Having been fortunate enough to be at the bedside when my mother and my late wife reposed I can testify to the incredible grace and life there is at that moment. Neither my mother nor I were Orthodox when she reposed, but God and His presence and His LIFE were most surely there. In the case of my late wife’s case, we were surrounded by the prayers of our priest and several fellow parishioners seen and unseen as she reposed. We don’t really pray for the dead you know, we pray for the living we can no longer see (most of the time), touch or directly experience as we used to. His life sustains us no matter where we are. Objections to prayers for the dead are also, seems to me, an expression of the false notion that God is elsewhere. But God is with us! That is one of the most fundamental and radical revelations of the Christian faith. While it is difficult to realize all the time, it is nonetheless the reality of our lives or we would not be at all. As always, if I am wrong I invite correction. Christ is Risen and upon those in the tombs bestowing life! We do not assume or presume that we are righteous in His sight, and therefore ask for these prayers…not so much in doubt of His gifts, but in doubt of our own faithfulness in producing a yield with those gifts, which are as “filthy rags.” There is a humility here…not doubt. No one knows how they will be judged…except to say that we will all be judged in accordance with what has been given to us to produce fruit with. We know God is merciful but do not presume righteousness of our own in His sight. Sin is always before us as we work with the further gifts we are given. Scripture speaks of this often; the parable of the talents and the vineyard ‘ vine, etc. To know and proclaim that the righteous will not suffer torment is not at the same time presuming we have claim to that righteousness by fiat or works. We know many will say “Lord, Lord” and yet be cast away into outer darkness. Fr. 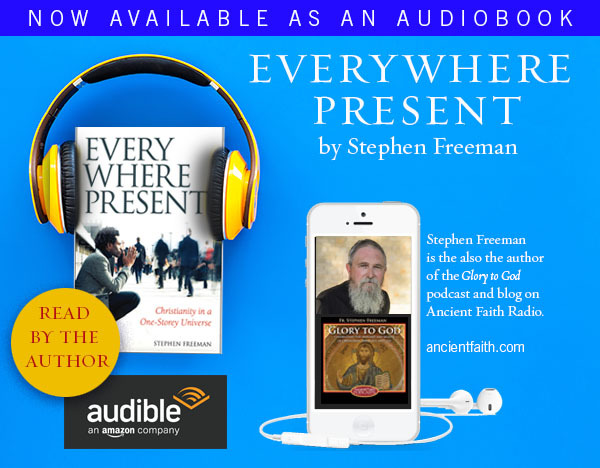 Thomas Hopkins of blessed memory has two great podcasts on ancient faith radio about the sermon on the mount which I think speak to this dichotomy. The gift is given, perfected, complete in every way. But we do not know if we have fulfilled His calling for us in accordance with the grace we have received in the Holy Spirit. Have we “grieved the Spirit”? Blasphemed the Spirit?” Have we been faithful or unfaithful servants; this is the question. So, we both trust in His mercy and seek after His righteousness –never presuming in prelest that we are either worthy or have fulfilled this in ourselves, and we approach Him on that final judgement day in humility and fear asking for His mercy in those areas in which we are still beset with sin. It has nothing to do with doubt, and everything to do with a humble and contrite heart before God which accepts every judgement of His as perfect. I have been following the thread here with great interest. I posted a couple of questions above, but I suppose they were lost in the mix, which is understandable given some of the, dare I say, “spirited” arguments that have occurred. As a (former?) Protestant I am coming to the conclusion that the differences between classic Protestantism and Orthodox are more than say the differences between Presbyterianism and Congregationalism and it seems to revolve around Sola Scripture (if I have any of this wrong, please fee free to correct me). So, in trying to think this through on my own I have come up with a question that I think will clear things up for me; if someone with an Orthodox worldview could answer it, that would be greatly and truly appreciated. Jesus was born of a Virgin. Protestants believe this because it’s in the Bible. Do Orthodox believe this because it’s in the Bible and it was affirmed by church fathers/ tradition/councils/etc.? Do I have that right? Thomas, please forgive me as I write here, I am an infant in the Orthodox Christian faith. What I’m about to say here is about the “lens of legal imputation” and I humbly ask that you might consider my experience and reconsider whether or not that one has such a lens matters. The bulk of my life work has been in the field of physical chemistry, this is a branch of chemistry that is predominantly involved with the physics of atoms and molecules. When I worked in the university system I was invited to participate in an administrative committee to review curriculum documents before courses were accepted to be part of the curriculum. On one occasion the committee was given the curriculum documents for a geology course. Based on the way they were written, I held the interpretation that the geology faculty who wrote them had a fairly narrow view of the meaning of “Laws of Physics”. Based on my own experience teaching chemistry, I was concerned that the way the curriculum documents were written, students might develop misunderstandings. What I tried to suggest to the faculty member was a re-write of the documents so that the nature of the “Laws” might be better understood. She didn’t take my suggestions very well. In order to help her understand my concerns, I referred to the “Third Law of Thermodynamics” which defines entropy as zero when the temperature is at absolute zero (kelvin). The key word is “defines”. In others words this is a reference point. The reality is however that even at absolute zero there is molecular vibrational modes. Therefore, in reality, entropy is not actually 100% zero at the temperature of 0 kelvin. Saying this to her really upset her emotionally. I tried to appease her (thinking that her reaction had to do with the extra work of re-write) saying to her all that she had to do was to change a few words in the documents to avoid the misconceptions of what the “Laws” were. The issue apparently for her is that she *believed in the Laws themselves*, not the experimental (experiential) data to which they referred nor that the data actually changes as our technology to explore such phenomena becomes more precise. After upsetting her I couldn’t help her to calm down and she ended up complaining to the administration, mainly because the curriculum committee had “backed me” on my concerns. The lens of legal impunity is deep in our culture and its effects, at least as I have seen in my experience, are quite harsh. Pardon, I intended that last sent to read imputation instead of impunity, but perhaps the slip works after all. Thank you Dino, outstanding comments (as usual). From my experience on the inside, the simple truth is that for Protestants who regularly attend church, they don’t actually believe in SS, even though they claim to. They are actually following interpretations (traditions) of Scripture given to them by their pastor and the notes in their study Bibles. Sadly, these traditions that they follow only go back 500 years at the most. Thank you for responding. My upbringing certainly acts as an “earworm” with regards to those issues. I suppose it comes from the Protestant hermenutic of using the “clear” passages to interpret the “difficult” ones, and Revelation falls in the difficult category compared to a seemingly straightforward statement that the dead know nothing. As you say, that is very different from relying on the lived experience of the church. It requires a considerable change in thinking. Dee of St Herman – Thanks for sharing this experience. I merely meant to say that for the question at hand it does not seem to matter much whether “torment” is seen as the result of a legal decision or the effect of “our broken communion with God and others.” Maybe it does. In any case, for me the puzzle I describe does not arise from reading “torment” within a legal framework. I can just about imagine how on a certain understanding of purgatory “torment” might have positive connotations in which case it would be different from a legal framework in which torment is a negative thing. But the prayer does not ask for torment, so torment is presumably understood as a negative experience and as such the prayer seems to proceed from the assumption that it is possible for faithful Christians to suffer negative experiences beyond death. This is the issue. They are actually following interpretations (traditions) of Scripture given to them by their pastor and the notes in their study Bibles. Sadly, these traditions that they follow only go back 500 years at the most. Some care needs to be given here. I have heard many Protestant pastors use references from the Didache, etc. in their preaching. The point being that they do not see their traditions as only beginning only 500 years ago and it is rarely helpful to make such a sweeping statement. Generally speaking, they actually believe the writings of the Early Church support their own views on scripture. I’ve been away for a couple of days, speaking at a conference and haven’t been able to pay much attention to the blog. On torment – God derives no benefit by needlessly torturing someone. His justice does not demand suffering (that’s some legal fiction). We require something like “suffering,” that is described in many ways. St. Paul uses the image of fire “burning” up hay, wood and stubble (our useless and sinful actions). St. Gregory of Nyssa uses an image of mud being scraped from a rope. The point isn’t torture, but healing, correction, restoration. Some of the Fathers describe such fire (torments) as the love of God. A difficulty arises, I think, because the plain sense, or literal sense, of some passages pretty much looks like a threat of torture and punishment similar to that which would be inflicted by an angry ruler. And there’s no arguing that such imagery is there. But even when such imagery proceeds from the lips of Christ Himself, it is no unusual for the Fathers to press the matter deeper. And it is in that deeper and greater context that such punishments are interpreted as restorative rather than retribution. Then there’s the question as to whether such restorative action of God is ultimately effective (i.e. are all saved). And this we cannot know. But God has no need to punish us for the sake of punishment. He only desires good for us and for all. It’s for that reason that we can be confident of the goodness even in such troubling passages and statements. I’m going to write an additional article on after death issues. Thanks! Well, you have to bear in mind that the Orthodox believe it because they have always believed it. That is, we believed it even before it was recorded in the New Testament. The Orthodox Church is the Church that wrote the New Testament. But, having said that, it’s kind of a “chicken and the egg” question. It’s not just that it is recorded in the New Testament, but that it is mystically hidden repeatedly in the Old Testament, in signs and symbols and types, etc. It is not just a miraculous event, but an event that is directly tied to the nature and working of our salvation. One of the problems in most Protestant thought is that it’s rather piece-meal and sporadic. They do not see the “seamless garment” of the faith and how the whole of the mystery is unfolded. May God help you in your questions and guide you. If the first parish you visit causes problems, look around. Parishes are like people, they can be very unique with personalities. You will like some personalities and not others. It’s not a cookie-cutter thing. It’s the same Orthodoxy, but some personalities, if you will, can be off-putting. For example, here in the South, “convert” parishes are common because there are so many converts here. Sometimes, parishes in the North have little experience with converts, for a number of historical reasons. And they may not understand the questions you need to ask. But there are plenty of exceptions to this observation. I only mean to say, don’t give up. Here is a directory page that might help you find a parish near you http://oca.org/parishes/state/NY. I suggest the OCA 1st because they are a little less likely to be ethnic and predominantly use a language other than English for Liturgy. If you look at the page you will find quite a few that may be nearer to you than you know. I lived in the Utica Rome area for 13 years and never knew there were any Orthodox Churches, but now I know better. Come and see. Byron, I guess you and I have been around two different groups of Protestants. I was an Evangelical Protestant (a serious one) for 40 years, and I’m not sure I ever heard anyone even mention the Didache, or Eusebius, or anyone/anything like that. I once listened a 13 part lecture / sermon series on Church history. That’s not a short series on church history. Somehow in that long of a series, the years 400-1500 were almost entirely glossed over. That’s pretty amazing to think about. Again, back to my opening comment, I rarely, if ever met anyone who could name one Church Father outside of the Apostles, nor cared about any of their writings. But more specifically to directly address your point, I’m not sure how what you wrote could be true. I mean, what do they do with St Ignatius describing the Eucharist as the medicine of immortality? Or, writings on the ever virginity of Mary, or a whole host of other topics? My point was simply that in my decades long life in Evangelicalism, I found that virtually all people truly think they “just believe the plain teaching of the Bible.” Yet, if the teachings of the Bible are so plain, why are there thousands of P denoms, with wildly varying beliefs, yet each claiming to “just follow the Bible”? In my former circles, people would adamantly state that they follow no tradition. But if the lengthy notes in a study Bible, and the pastor’s interpretation of passages don’t count as a tradition, then I don’t know what does. Generally speaking, they actually believe the writings of the Early Church support their own views on scripture. They don’t believe Tradition supports their views – they simply don’t allow Tradition to form and mold them – rather they form and mold it. My thought as pertains to this whole matter – and I admit I have no idea whether or not it is backed up in Holy Tradition, but it seems sensible to me – is that we tend to see Heaven and Hell as binary, all-or-nothing places or even states of being. I.e. either we will be in indescribable, “perfect” bliss or unimaginable torment. When based on the way everything else in the Cosmos seems to work, it’s more likely to be a spectrum of sorts: to those who have by rigorous asceticism and the like produced much fruit, who have loved God above all, the joy will be greater than the “average” Christian; to those who have known the truth but hated and rejected it, the [self-] torture will be greater than those who are largely ignorant of things. Again, I realize my own ignorance (especially due to my lack of humility and virtue, never mind not being well-read in these matters), so I may well be off the rails. My response to this may strike you initially as esoteric — but God willing — should you continue in your path of investigating the Orthodox faith — I hope this will also be an experience you share in. Please forgive the length. There is typically a trajectory of faith life for the “intentional” Orthodox believer. That trajectory may have different starting points. My starting point was “hyper – rationalistic” Calvinism. So I started from the point you speak of – believing a thing because it is “in the Bible” – for whatever that’s worth. Now, what initially led me to Orthodoxy was rational and undeniable facts about history and the practices of the earliest Christians and the way Orthodoxy actually made sense of Christian life…rationally. I believed because it made sense of the Bible and Christian life…not much unlike the reason most anyone will accept one or the other denominational tradition. But this was really still external – and not so dissimilar than my Protestant faith life. I evaluated a Tradition based on my mind, and luckily did not reject it for one reason or another. I chose (or thought I chose) it. All I had to do was accept Tradition I thought…and place the Scriptures in that context. And to an extent that is true…as a beginning. But that leads to something else…something deeper… Something unimaginable in my previous life. As I began to participate in the life of the Church – I did not believe because some “authority” told me so – but because things began to simply “make sense” in a relational way. I “knew” in my inner being – not in my mind. It becomes a kind of organic flow to Christian life instead of a mind racing to come up with right ideas. The ideas are there to guide us into an experience with God – but our path in Orthodoxy leads us beyond the external things to direct personal experience with the Holy Spirit who illumines our entire being and reveals belief. Thus, our experience with the Holy Spirit confirms Orthodox truths – not simply texts. The texts begin to be illumined…and our “eyes are opened to the Scriptures” and the Fathers, etc. At a certain point, we go from comporting our lives to texts – to the texts being reflections of a common experience – because we begin to share in the same experience as the Father’s and Saints and can relate. It’s much like two people seeing the same movie and being able to relate and laugh about it – while someone else is unable to because they have not experienced it. Then, if that person went and simply read the screenplay or a review – would they have experienced the movie itself with all of its cinematography, sound and the actors nuances which bring the screenplay to life? In much the same way — when I became Orthodox I first noted that it brought Scripture to life — I was no longer examining Scripture – but living in Scripture. So, for example — I resisted Iconography and prayers with the Saints for a time after I became “Orthodox” – but resolved in my heart that God would make this clear to me and that I would not force myself to do things I wasn’t ready to do. So…I didn’t. I don’t know how or when it happened…but there was a drastic change. I began to *see* the Saints in iconography. Literally, I’ve seen them – but not in the sense of my physical eyes. But in my heart and my whole being I *know* what I have seen because He has revealed a truth to me that I cannot explain as a logical proposition. I *know* in an intimate way the communion of the Saints which these things reveal…but the things themselves did not reveal it. So…asking the question regarding the basis of our differences rests not only in Sola Scriptura — but in something much more living and moving. When you ask; Do Orthodox believe this because it’s in the Bible and it was affirmed by church fathers/ tradition/councils/etc.? Do I have that right? there is a bit of an impasse. Yes…we do…as a start. As Orthodox we start here. But then, we don’t believe because of these things…but because God has revealed them to us. Its alot like trying to explain why we “believe” we love our wives. In the beginning it may have been about A,B, and C and we might have been able to make a list of all the qualities and reasons. We can list this or that quality about them…but in the end…and as our relationship deepens — our love is based upon the movement of our two souls in in union with one another. We don’t need to affirm our love by pulling out the marriage certificate and reading it to believe in our love — or our vows to affirm what the marriage certificate says…or to the list of attributes we saw in them way back when. Instead, our experience in the life of love in the Church (or in marriage) reveals to us and affirms all those things which are and have been put on paper. The real life – the true life – is lived – not simply read. As a Protestant – I never experienced anything like what God has given us in the Orthodox faith. I don’t deserve this gift….just like I don’t deserve my wife. I cannot express to you the depth of either… or the basis for my belief in either. The difference between Protestantism and Orthodoxy – in my experience – is the difference between analyzing the mechanics of sexuality and basing a marriage on those mechanics vs. the experience of love and sexuality in a ever deepening marriage based on mutual co-suffering and kenotic love for the other. The former form of sexuality objectifies it and rips it out of its context…it becomes hollow. The other is life and leads to life. Blessing as you journey towards Orthodoxy. CJ, somehow Orthodoxy never lost the recognition that in the resurrection Christ “trampled down death by death, and upon those in the tomb restoring life.” Those dead in Christ are ALIVE, in whom death has no countenance. For this reason they will use portions of Traditions when they are helpful to their own pet cause or interpretation – and deny them when the Father’s don’t comport to their views – or else “reinterpret” them. I agree with both of you, Onesimus and Alan. However, as has been pointed out, there are many thousands of Protestant denominations. I have heard pastors reference the Didache and the Church Fathers. The point I made was that they typically see their denominations as in conformity with the Early Church. However, as Onesimus’ example illustrates, they completely misinterpret them or belittle their witness. That doesn’t change what they believe about themselves however. And this is why it is dangerous to make sweeping statements about their beliefs when speaking with them. In any conversation, we will end up debating what they think instead of speaking the truth. After this moment of hesitation, he softly answered me; “Truly, He is Risen!” It was for me the most assuring proof that I was never misled in this regard: the one who was torturing me (for Christ) was confessing the Resurrection of the Lord! I cried in silence with tears of joy. I’m finding what you’ve you’ve written really interesting & helpful. It’s still so new to me, the idea that the Church wrote the Scriptures, & that the original hermeneutical/interpretive community is the Apostles. & those they spread the word to, who ended up as the church. I had no idea that the first Christians saw things about God differently from Calvinists, & how late those ideas appeared: original sin, personal election etc. If it was the other way round the Calvinist movement would be yelling it from the rooftops, rather than nit picking. I have been reading through Father Stephen’s blog entries that come under Scripture, to my gain. (I also realised I am not the first person fleeing the Calvinist ‘God’ to wash up on this shore… some of the commenters sounded just like me & I hope each & every one is now in a much better place theologically). Can you think of other reading that might help me grasp more firmly the understanding of the authority of the early church community’s interpretation of Scripture, based on the fact that they produced it? Who is there in the Orthodox Communion who has come out of the views you encounter at Seminary – the cherry picking etc- who sees all this logically & clearly? I dream of the day that my knowledge of the authority of the Church Tradition eradicates any lingering worries about God’s character. As a graduate of a Wesleyan Arminian conservative Seminary, I was schooled in Apologetics, Evangelism and debate in favor of the faith. However, since my conversion to Holy Orthodoxy, completed shortly after graduation, I have discovered that debate with those in the Protestant faith is generally not productive. When they are not blind to something, they have an intellectual trap door to escape from the conclusion to the argument. Many of the people I serve with in Pro Life ministries want to debate me over faith and try to “convert” me through their arguments. So far, my logical arguments have been a dismal failure in convincing them of the error of their beliefs even though I can easily find the contradictions and irrationalities built into their belief structures. I have come to the point I won’t debate them directly, I simply saying that whatever I am saying is a teaching of the Apostles. Then I let them do with that as they will. I have used (and just recently here) the support of Saint Paul’s words in Galatians Chapter One concerning the preaching of something other than the Faith Once Delivered. I got the same result here as I do with people in person….they take it as a personal insult that I do not accept their faith statements as the real truth. I have tried pointing out to them such things as when certain of their beliefs became teachings (Rapture 1825 for example) but this is totally ineffective. Sometimes the Orthodox fall into arguments. Most of the time, Protestantism is an argument. That’s where it was born and how it lives. They have never had an experience of being a form of Christianity that wasn’t in opposition to some other form of Christianity. If all other forms of Christianity disappeared, they would invent more. 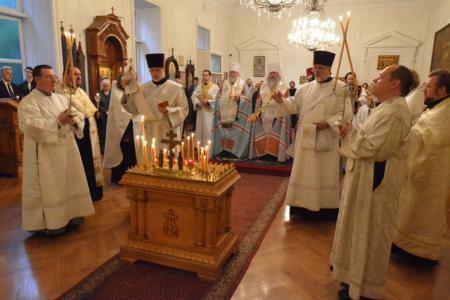 If Orthodoxy were left alone, it would simply be at peace. The faith is not an argument. Renewal, live in the Church, participate in her life as completely as you can, what you need will be given to you. Some beliefs will gradually fall away, some will need more direct work. If that is so, what you need will be given. Tend the ground of your heart so that it will be ready to receive and the roots will be deep. I wholeheartedly agree although, coming from a Protestant background, a part of me still wants to “argue it out”. God bless all! Christ is Risen! When I read your comment, I thought of a book a priest had recommended to me when I was a catechumen, called “The Apostolic Fathers” edited by Jack N. Sparks. By the time I had gotten to the Letters of St. Ignatius of Antioch in the book, I remember how I understood in my mind the truth of the Orthodox Church. It became undeniable to me. I had traversed from the Catholic Church growing up, to the Evangelical Protestant community in my twenties. I was finally home (in the Orthodox Church), and I could finally trust Church and the Tradition. I finally knew my Mother as the unbroken communion with Christ since the time of Christ. It wasn’t fractured and fragmented or confused as I had experienced in Western Christianity. It was passed down since the time of Christ, by Christ himself, built upon the firmest of foundations. As I entered therein, layer upon layer of Christ’s truth and presence slowly worked in my heart. The Church, our Mother, is sacramental, the Church touches all of our senses when participating in worship, it is circular as the great cloud of witnesses of the saints are all around us in the Church in her icons, the body is involved in worship in prostrations and reverently making the sign of the cross, our sense of smell partakes of the heavenly incense as our prayers rise to Heaven, candles touch our souls noetically with the light of Christ, the relics of the saints grace us with the power of the Holy Spirit. The Church is liturgical and we partake of the greatest of gifts, the Eucharist in trembling and thanksgiving. My words really do no justice for the experience of being in our Mother’s care, but as I remember the words of one monastic, the longest journey we will ever take will be the distance of about a foot–between the mind to the heart. Every day I am so greatful to be lead by my Mother’s hand. Me too Byron. I am still working to suppress that tendency. Shoot me an email by clicking on my name and visiting by blog. Sometimes knowing we aren’t alone and that we can talk to someone else who “gets it” and has “washed up on the same shore helps”. Stephanie’s recommendation of Ignatuis of Antioch’s letters were probably the single most transformative writings for me. Why? He was a disciple of Saint John the Apostle. His writings are the first generation after the apostles…and he was martyred in about 107. His letters can all be found online. I can get you some good resources based on your circumstances…but will always say the best thing to do is find a local Orthodox Church and priest…perhaps even looking for one with a convert background if possible. With our background…we have been taught to read things and think in a certain way….drawing conclusions by inference or deduction…which is simply taking a certain piece of “data” in the bible and extrapolating with our own “logic” (I.e. Imagination) what it means. So we process things through a matrix that is unhelpful when not tempered With sobriety in the life of the love of the Church. But…since we are where we are….it does sometimes take someone starting from where we are at and how we are used to thinking to get us past that. It takes time, patience, and love from others to begin to remove those lenses of Calvinism and have our hearts softened by His grace in the Body. If it can happen for me….it can happen for anybody. This has been enlightening to read everyone’s posts; thank you! I have a family member, a devout Evangelical, who occasionally tries to back me into a corner and argue theology. His style of argument is reflective of what others have said about Protestant argument: A piece-meal quoting of scriptures in support of what he is arguing. I usually don’t engage him because the conversations tend to lead pride and the passions. When I attempt to speak from the Mind of the Orthodox Church, he gets this perplexed look on his face, and I realize any more talking (on my part) is unproductive. Has anyone else experienced this? Any advice? This article about Orthodox funerals reminds me of the inscription on the tombstone of my grandfather’s sister. It gave me quite a start when I saw it for the first time. It reads: Remember me as you pass by. Prepare for death, and follow me. The gospel reading from this past liturgy tells us that our forgiveness has, is , and will accomplished. “Forgive us our trespasses as (makes this timeless) we forgive those that trespass against us.” It’s like forgiveness is a stream flowing into a pond, and back out again. It’s all the same body of water. When we don’t forgive others, it’s because we don’t realize we have already been forgiven from a debt that we could never repay. But no human, Christian or not, ever seems to be able to grasp this.